In November Dorje Palmo and her husband escorted a group from the Yongey Buddhist Center on a pilgrimage tour of India. The group visited many sacred Buddhist sites as well as the Tergar Monastery in Bodhgaya. Dorje Palmo’s husband, Dwayne, describes the tour. Upon arrival in New Delhi we were most fortunate and honored to have an audience with His Eminence Tai Situ Rinpoche. The visit was very cordial and everyone enjoyed meeting His Eminence and receiving his blessing. The next morning we flew south to Aurangabad to see the famous Buddhist caves at Ajanta and Ellora. These caves were carved over a period of several hundred years beginning in the 2nd century BC. Along with seeing the caves we were able to visit the Moghal monument Bibi Ka Maqbara that resembles the famous Taj Mahal but smaller. We next flew to Varanasi to start our pilgrimage tour. We were met by Lama Sotop, Lama Yonten and Ani Rutao who had come from Bodhgaya to journey with us. We first visited Sarnath, the cradle of Buddhism, where the Lord Buddha preached his first sermon. Before leaving we went to the banks of the Holy River Ganges and then onto a boat to watch the early morning sunrise. We then journeyed by bus north to Kushinagar where the Lord Buddha attained Parinirvana. We visited the Nirvana Temple and Stupa and also the cremation site on the banks of the Hiranyavati River. From Kushinagar we traveled to the ancient city of Vaishali where an Ashokan pillar marks the site where the Lord Buddha gave his last sermon. We also visited the Buddha Relic Stupa where some of the Master’s relics had been encased. From Vaishali we journeyed south to the royal city of Rajgir where the Lord Buddha meditated and taught at the Hill of the Vultures. We hiked up to Vulture Peak and prayed at the site where the Lord Buddha taught the Heart Sutra. Near Rajgir is Nalanda University that was founded in the fifth century AD and flourished as a school of Buddhist learning for over 600 years. We visited the museum as well as explored the ruins of this famous site. Finally our pilgrimage tour traveled to Bodhgaya, the site of the Lord Buddha’s enlightenment. Our stay in Bodhgaya was at our Guru Mingyur Rinpoche’s Tergar Monastery where we were warmly welcomed by the monastery staff. At the morning Puja Dorje Palmo and members of the group presented offerings on behalf of the Yongey Buddhist Center to all the lamas and monks in attendance. Following the Puja, Dorje Palmo was asked to give a talk where she encouraged the lamas to follow our guru’s example and teachings. We were then presented with gifts from Lama Sotop after which a group photo was taken in front of the temple with all the lamas. While at the monastery we were fortunate and honored (again) to have an audience with His Holiness Karmapa. This auspicious visit was very special since many in the group had never met His Holiness before. Later we visited the Mahabodhi Temple and joined with the other pilgrims paying homage to this sacred site. We circumambulated the Stupa and the Bodi Tree as the sun set and darkness descended upon the temple grounds. 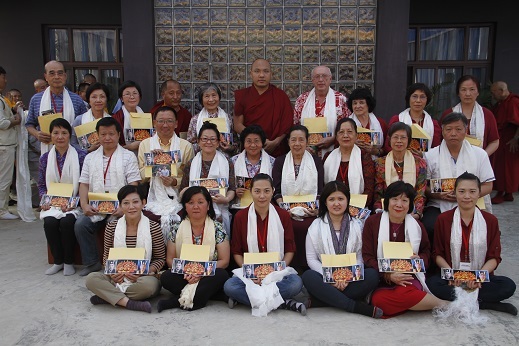 That evening Dorje Palmo and the members of our group hosted an appreciation dinner for the Tergar Monastery staff. A special guest was the elder sister of His Holiness Karmapa. Agnes: Everything was well arranged. Every place we visited was special to me. It was so amazing that we were able to meet His Eminence and His Holiness Karmapa. Cathy, Wendy & Mom: Thanks for Dorje Palmo’s special arrangement, we were so very lucky to have the opportunity to meet His Holiness Karmapa, His Eminence Tie Situ Rinpoche and have dinner with His Holiness Karmapa’s sister. … a most wonderful and unforgettable journey. Patricia: Having tea and chit chatting with his Eminence the Tai Situ as if we were old friends was amazing… Being in the presence of the Karmapa has no equal in my experience… Arriving at Kushinagar at sunrise was a moment of quiet reverence that reminded me of the profound nature of the Buddha’s impact on the world… The beauty of the rows of statues of the Buddha dating back to the 6th century AD at Ellora and Ajanta were magnificent to behold. One wonders who were the monks that lived there and their history, which has been lost. Only the statues remain… I enjoyed casting floating candles on the Ganges at sunrise in Benares as prayers for my friends and family… The tour was beneficial to me in ways that have not yet fully come to my consciousness as there was so much experienced. Albert and Susan: In those wonderful places visited, we felt the most special was the experience with His Holiness Karmapa. His short enlightenment sheds the light to our whole life. Chinyu: Yesterday I was looking at the photos and have forgotten some of the places… but I am very happy to have gone on this trip and have such an enjoyable time. Everyone was like a big family. 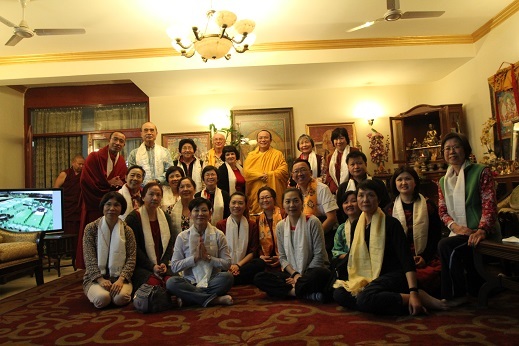 Jennifer: Visiting the Tergar Monastery and enjoying the company of all the young lamas was very special for me. I especially liked the lunch we had with the lamas in their cafeteria; the food was very wholesome and delicious. Zoey: Road conditions were very bad and the bus ride very long, but when you think back that the Lord Buddha and His disciples did that on foot, I felt much better… Kushinagar, the place of Buddha’s Passing Away, was very special to me. When seeing the Lord Buddha statue lying there in the Nirvana Temple, I was overwhelmed… India is a very colorful country with a lot of history and mysteries which I feel that I will visit again to quench my thirst of seeking all the Buddha’s footprints. Caroline: This was a wonderful trip and very tough due to long drives and rough road conditions. Regarding pilgrimage sites that we visited, I appreciated the whole arrangement because we are Buddhists and this was a once in a lifetime visit… It’s worth it. Joyce: A special place for me was the Nirvana Temple in Kushinagar. The commemoration ceremony held that day inside the temple was so peaceful, and the melodic chanting by devotees was absolutely unbelievable. The atmosphere was very touching. I was glad to be able to walk in and around to watch this fantastic ceremony… India is amazing and fascinating; I had a really great time. C.T. & Shuyun: We believe the pilgrimage, staying at the monastery, visiting caves, and visiting Taj Mahal were a great combination. Seeing His Holiness Karmapa and His Eminence Tie Situ Rinpoche was icing on the cake. Road conditions and associated problems were unfortunate but is part of traveling around the world and knowing the culture… The visit to the Mahaparinirvana Temple was probably the most memorable. The early morning mood, the foggy sun-rise, and non-hurry situation allowed one to fully embrace the feeling of being there… Overall, I strongly feel it was a worthwhile trip. If I have a chance to go to India again, I will probably fly direct to Bodhgaya and stay there for a few days to really experience the place at various settings and do meditations there, especially under the Bodhi tree.